And so it was; in a lengthy SF Weekly piece about the mishmash of conflicting regulations and practices regarding marijuana and how they might be affected by this November’s statewide referendum on its legalization, my lovely old Laytonville loomed large. True to form, the story offered everything one might have come to expect of Laytonville: tie dyes, aging hippies, cranky opinions, hot, dusty roads cordoned off by locked gates and paranoia, the promise of untold riches dangling against a backdrop of hardscrabble poverty, and, of course marijuana. Lots and lots and lots of marijuana. Laytonville, never an easy town to love, has an softer image these days, perhaps not only because of the perennial cannabis haze in which it basks. It was not always thus: when I arrived at the end of the 1970s, it looked like nothing more than an unkempt aggregation of gas stations, motels, stores, churches and a single bar strung along a low-lying stretch of Highway 101 and baking miserably in the unforgiving sun. Population 991, said the sign at one end of town and 1,018 at the other; nobody knew for sure which it was, and how could they, since nobody had any idea where “Laytonville” actually began and ended? It wasn’t a real town at all, in that it had no local government or elected officials. You might say it was more a state of mind than an actual physical place, yet there was no doubt in people’s minds as to whether they lived “in town” or “up in the hills,” the latter being where the majority of the local population, soon to include me, made its home. 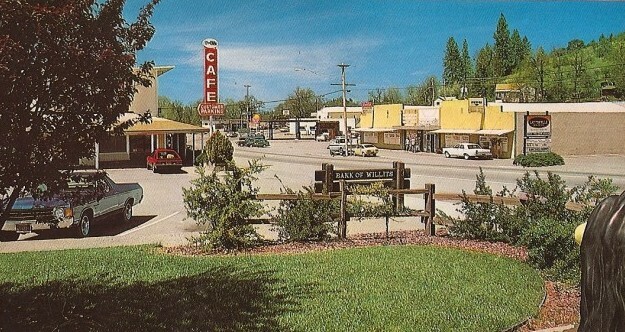 In those days, there was much more of a divide between the hill people and the town people, or hippies and rednecks as they were more simplistically categorized; since that time, as the area has grown rich from marijuana and the urban incomers have taken on country ways, most such lines have vanished. With logging and ranching all but extinct as viable economic activities, and tourism never likely to become the major factor it is in more scenic and temperate coastal Mendocino County, marijuana has become the one and only rising tide to lift all local boats. Shopkeepers and businessmen who once turned their noses up at longhairs and hippies could never afford to do so nowadays. In fact, as the SF Weekly article makes clear, longhairs and hippies (at least the ones bringing in the big bucks through growing) are becoming the establishment. The idea of two tie-dyed Deadheads hobnobbing with the Sheriff about the size of their annual harvest still seems more than slightly surreal to me, having spent my own Laytonville years at a time when the sight of anything resembling an official vehicle on Spy Rock Road would send waves of panic juddering across the canyons. Now they’re inviting the Sheriff to come up and inspect their marijuana patches? Well, times do change, but I never could have imagined so quickly and so dramatically. All this came about thanks to the very clever wheeze known as “medical marijuana,” which overnight magically turned thousands of marijuana growers and dealers into “providers” to the sick and suffering. I don’t wish to be entirely cynical, but just as I have yet to encounter a single “patient” whose primary purpose for obtaining marijuana wasn’t to get stoned out of his or her gourd, it also never occurred to me that the principal driving force of the medical marijuana movement was anything other than getting the camel’s nose of legalization into the tent of public policy. Now, apparently, it may be about to happen. My guess is that Proposition 19 on this year’s California ballot will be narrowly voted down, but that it’s only a matter of time before a better-drafted version comes along and wins approval. The Anderson Valley Advertiser’s ever-reliable Mark Scaramella compiles a laundry list of what’s wrong with what he only half-jokingly refers to as Prop 420: the gist being that it’s so poorly thought out and written that, rather than finally imposing some sort of order on the increasingly troublesome and violent pot trade, it will only set off a free-for-all that will dwarf the Gold Rush/Wild West situation spawned by the semi-legalization “medical marijuana” scam. Given that the average 20-acre parcel in the hills above Laytonville could easily produce a ton or so of weed annually, and that with prices already plummeting as a result of the current semi-legalization, it’s hard to believe that further liberalization of pot laws will result in anything other than a massive increase in growing along with its attendant problems. Such as? Well, put it this way: in the 20+ years that I had a home in the Mendocino County hills, “home invasions” were something that happened down in the dicier precincts of Los Angeles or Oakland, not the leafy backroads of Spy Rock and Iron Peak. To be fair, the handful of people I know who still live up there have had no such experiences, and life for them has continued at more or less the same relaxed pace it always has. But they’re small-scale growers, or don’t grow at all. Even when I left Spy Rock for the last time in 2004, I couldn’t help noticing a distinct change of climate. There was the proliferation of locked gates, for example, not just on people’s driveways, but even across the roads themselves. If you weren’t immediately recognizable – and being only an occasional visitor during those last few years, I wasn’t – you’d get the ice-cold stink eye from the big-time growers as they careened past in their high-powered SUVs. I’m sure there’s still a lot of neighborliness, sure that passing cars still stop at the crossroads or the ridge top for hour-long conversations about the weather, the crops, and who ran off with whose wife, but that a lot has also been lost as marijuana went from being a lucrative sideline to big business to being pretty much the only business in town. Yes, I still miss those hills tremendously, even miss the long trips to town, the visits to Geiger’s General Store and Bill Bailey’s logging supplies HQ, but I don’t know if I could ever live there again. Even though by some standards I could be aligned with them (I’d prefer not, but there’s no denying the demographics), I can’t help observing that the hippies who first trickled, then flooded into the Emerald Triangle have transformed the region almost as rapidly and irrevocably as did the white European settlers who displaced the original occupants. Was it all for the bad? No, of course not; 30 years ago your chances of dining on anything more exotic or healthy that a Loggerburger at the Laytonville Inn were slim to none, and the area, despite its undeniable charms, bore the equally undeniable trappings of a rural slum. Had it not been for the marijuana pioneers, Laytonville and environs, now stripped of their forest resources, would most likely resemble a ruined Appalachian community after the strip miners had come and gone. Now they’re envisioning the area, post-legalization, anyway, as a marijuana-oriented counterpart to the Wine Country. Supposedly tourists will come to sample the exotic varieties of weed developed by local horticulturists, and stay to spend their big city bucks in pot-themed restaurants, shops and B&Bs. Sounds like an absolute nightmare to me, while at the same time my more avaricious side can’t help calculating how much I might have profited by hanging onto my 40 acres of prime Marijuana Country property. But mostly I’m feeling nostalgic and sad about good old Laytonville, a town I once found hard to like but learned to love, a town that soon will bear little resemblance to the glorified stagecoach stop it managed to remain from the 19th century through most of the 20th. It may never become another Napa or Sonoma – perhaps the Yountville of the North County, or, setting its sights extremely high, the new Boonville – but never again the poky little place that – admittedly after considerable resistance – took me in and welcomed me as one of its own. I was never there in the 70’s but lived there in the late 80’s and early 90’s and it was still much like you described but we stayed out near branscomb. at the time we lived there the population was down to the mid 800’s according to the sign on the south end of town .All I can say is I hope they have the sense to not turn the place in to some town where you cant get a decent meal at a greasy spoon because all they serve is tofu burgers and bean sprouts.The dinner there was like any other dinner where working people eat nation wide good greasy breakfast decent burgers and the people were just a nice as could be regardless of who you were or what you did. what i fear most is someone is going to want to replace the old A-1 market with a AM PM mini mart or a 7-11 or the mercantile with a safeway or home depot..There are so few places like laytonville left .Of coarse there where like you said the few people that where always suspiciuos of their neighbors and would never wave to you passing on the road or would not say hey at the store maybe becuase they had a lot to loose and were scared of being robbed by new neighbors or the cops but the people we met there where the best real neighbors you could always rely on if you needed a hand and the veiw from our home across the mountains was one of the best ive ever seen any where. I wouldnt trade the time I spent there for 2 more life times. I have often wondered if it will still be the same when I am ready to go back when I retire but with prop 19 looming there is probably a good chance that most of what I remember of my favorite town in america will be long gone and laytonville will be more like the big city down to willits or Ukiah than the little quiet town I still miss..